Why Become a Deputy Attorney General? > Download With nearly 8,000 employees and a wide-ranging mission, the Department of Law and Public Safety offers attorneys a unique opportunity to engage in complex civil and criminal litigation, while serving their community and the State. 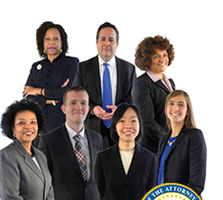 Whether you are interested in litigating cases making headlines, prosecuting violent or white collar crimes, or fighting on behalf of consumers, the Department of Law and Public Safety has a place for you. We are looking for attorneys of the highest ability, possessing sound judgment and a commitment to public service and the State of New Jersey. If you meet this description, consider a career with the New Jersey Department of Law and Public Safety.